Urgent: We have less than a month left to make our voices heard! Add your name before January 2nd to help save the sage grouse! The Greater Sage-Grouse is an icon of the American West. Stakeholders including conservationists, businesses, state and federal agencies, ranchers and more spent years working together on a collaborative management plan to help protect this striking bird and the land that it needs to survive. Now, Washington politicians are threatening to undermine this landmark agreement—with dangerous consequences. 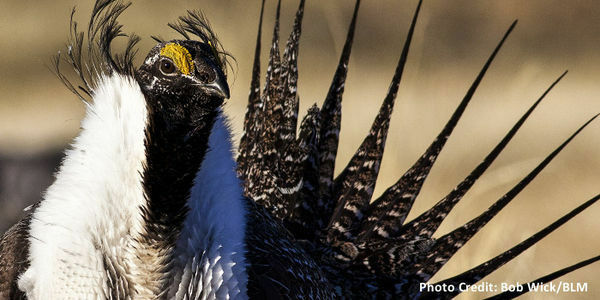 The U.S. Forest Service's proposed changes to the sage-grouse conservation plan could have a devastating effect on this iconic American species. Combined with proposed changes to conservation plans from the Department of the Interior, this could lead to the extinction of the sage-grouse. We must continue to send our message: Communities throughout the West and Americans across the country want to keep the current plans in place and working—we need to protect this irreplaceable landscape. By signing this petition, your name and comments will become part of the official public record. The future of conservation and protection efforts for the Greater Sage-Grouse, and over 350 other species that rely on the sagebrush to thrive, have never been more at risk. As someone who cares about birds and the places they need, now and into the future, I strongly oppose any amendments to the Forest Service sage-grouse land management plans. * Maintaining sagebrush focal areas and priority habitat. * Limiting waivers, exceptions, and modifications from lease stipulations to narrow circumstances ensuring that input is gathered from the Fish and Wildlife Service and confirming that concurrence is obtained from state game and fish agencies. * Only permitting activities that will cause loss of sagebrush habitat where a net gain of habitat can be assured. The plans in place are working exactly as intended. The Forest Service's proposed amendments would threaten to undo this progress and ultimately harm the sagebrush landscape for generations to come.